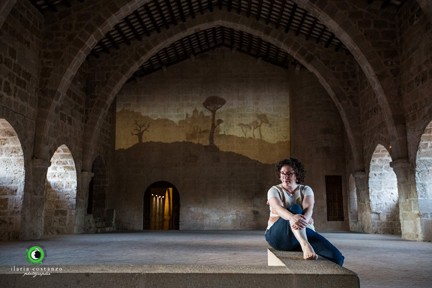 During two weeks, fourteen artists and six members of the Forman Brothers Company team were woking on a workshop in Santes Creus Monastery, 35 kilometers inland from Tarragona, Catalonia. 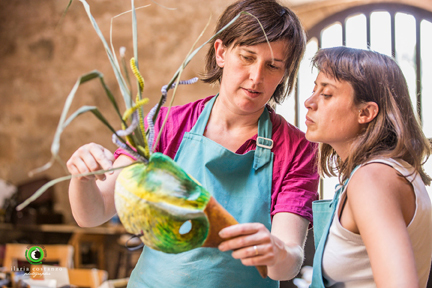 It was scheduled and coordinated by Atelier della Luna, an organization aimed to offer masterclasses, courses and workshops to artists from different disciplines —but mainly performing arts— in Italy and Catalonia. Their purpose is to set these in places that provide a unique inspiration to the participants while trained by accredited artists. So was the case of this last workshop. Santes Creus was a former Cistercian monastery that can be currently visited as a turistic site. Anyone who get there will suddenly feel captivated by the strength of its history, the beauty of its buildings and its enchanting environment. And that’s where those twenty people experienced that workshop —even in a more intense way as they installed their atelier in rooms that are normally closed to general visitors and worked there every day, fifteen days, from 10 am to 7 pm. Though the works didn’t finish at that time, which is the time that general admittance closes. They continued on a theoretical level through discussions, presentations and debates in a space ceded by the city hall. The workshop started one Saturday with Martin, part of the team, carving wood to make czech-style marionettes. Though the Forman Brothers mix many languages in their shows, such as cabaret, circus, dance, mask theatre and visual arts, and they are well-known worldwide for that, puppetry is still their base. 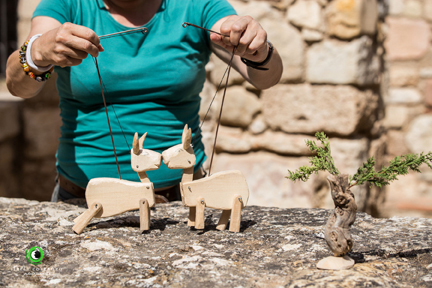 So making those little marionettes was the very first thing they asked to the participants to know what they could do. Some of them found it very difficult as it was the first time they worked with wood. Others, instead, were already trained in this kind of work. In a similar way, some were experienced in performing arts and others came from the plastic arts or had little training in body expression. The Forman Brothers workshops have been often focused to a specific technique or to the construction of marionettes, but this time it was different. The difference came from the very proposition of Eudald Ferré and Luca Ronca, directors of the Atelier della Luna. 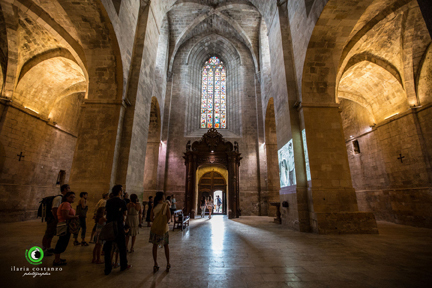 Their plan of doing the workshop in Santes Creus Monastery for initially three weeks, later reduced to only two and with a final public presentation shifted quite a bit the line of the work. (They needed two years to prepare the workshop, with long telephone conversations and translations between Czech, English, Italian and Catalan, and inconvenients like a flood that moved the dates forward.) Finally the Formans came from Prague with two vans loaded of tools and machinery to set the workshop and the idea that every attendant should do everything: carving wood, paper masks, lithography, puppetry, stop-motion, sound design and staging an installation or scene. Andrea Sodomková (left), from the Forman Brothers team, discussing with one attendant to the workshop. Matej Forman got to Santes Creus on Sunday and made a proposal to the participants of what to work on. He had seen the pictures of the monastery that Eudald and Luca had sent him and he understood that was invited to a very beautiful, special place. 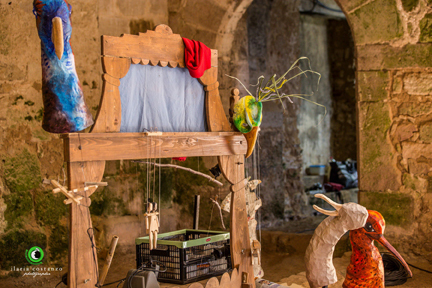 What he and his company were requested to do there went beyond the regular: “It gave me the opportunity to develop more the work, to go more steps up than a simple approach to puppetry: can I make puppets? ; what can I do with a puppet? ; how can I play with it? ; can I tell a story?”, Forman says. The central idea was to work on the subject of the creation. Matej gave to the participants texts that explained the creation of the world according to some Amazon cultures, to the Aboriginal Australians and the Bible, and later the legends of the lands in which Santes Creus Monastery was founded and its very foundation were put along the other myths. During the workshop, they worked in three rooms, apart of the visitors. Two big ones delimited by big stone walls, high roofs and unpaved ground; the first one, with two arches from side to side, was used as a creation room to make masks, puppets and scenography; the second was to make costumes and designs on the computer —and where they also had a coffee machine. Those two rooms had been formerly the stables of the monastery and the royal entrance to the building that connected with the rooms reserved to the kings of Aragon when they came from Barcelona. The third space of the workshop was a tiny, dark room attached to the stables now converted into a stop-motion studio. One of the rooms of the workshop. So the possibilities were wide open and it was certainly a challenge for everyone. 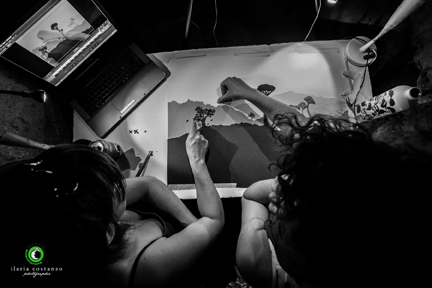 In the team of the Formans there were, besides Matej Forman and Martin, Andrea Sodomková (set and cosumes designer), Veronica Šváková (dance and music), Anna Krtičková (puppetry and animation) and Irene (photographer), but —what was the path to follow? At one point at the beginning it seemed to be unclear to the participants and so they could feel some discomfort —something in between surprise and disappointment. Because the Formans weren’t leading them, but just offering support. The system of the workshop came clear after some of those theorical sessions they had in the evenings, specially after the company could tell how is the creation process they follow for their own shows. They do not expect any of the artists to do a particular thing, but rather they push this artist towards his own path, offering resources for anything he or she wants to do —or try to. So they worked individually on everyone’s wills and needs. Who needed more help got more and who needed less was simply suggested to try things. Mask making, dancing, staging... a whole process. 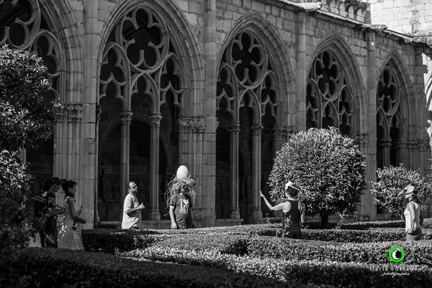 In this picture, there is the ritual dance of birds, that made part of the first scenes and was performed at the cloister. Many techniques could be seen in the presentation. In this case, the legend of Santes Creus, beutifully narrated and interpreted with Czech-style marionettes. It could not be considered a show or a final performance. It was instead a journey through a place and the work made in that place. 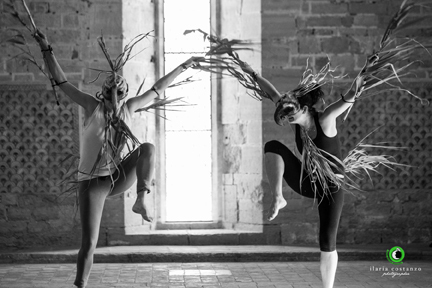 In fact, Ferré and Ronga picked the title ‘Evoked Moments at Santes Creus Monastery’ for it, as it was a mix of installations, situations and sketches about the land where we were. Unexpectedly, 409 people went to Santes Creus to see the result of the workshop. Many of them were artists, teachers or prefessionals of puppetry in some way. The expectations were high and so the fourteen participants in the workshop, the six members of the Forman Brothers Company and the organisation of Atelier della Luna were nervous. They had a general rehearsal the day before and some adjustments had been made since. Parts of every personal project had been cut off to give sense to the whole tour. Though it was not a show, they were all concentrated as if it were a premiere. And when the general admittance to the monastery closed in the evening, those evoked moments were given life. Birth of life in the dark, from seeds, one of the ideas performed at the end of the workshop. It may be obvious that a creation as that would firstly go to a staging of time. But still it was a surprise. People went into the monastery in groups of 25 and passed throug the different places in which a situation was set. First, the lavatory right after the main entrance like a ritual passage to the cloister. We were asked to wash our hands and close our eyes; then the water stopped, masks were put on and so we could go into a transformed place. Final scene in the former dormitory of the monks, with an animation on the history of the place. An installation that evoked the beds had been set in that room too. Some symbology related to the creation was put on location as we passed from the cloister to a corridor and more inside until a former Middle-Age dungeon: birds, eggs, cocoons, flying seeds and shadows. It was clear they had worked a lot the visual perspective. 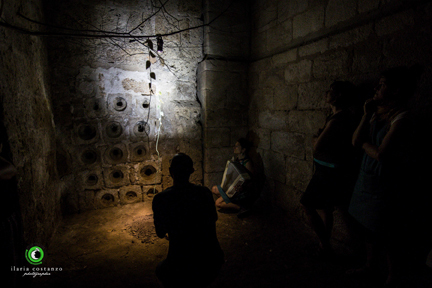 After that going into the dark, some storytelling was performed: the Aborigin story of the frogs that stole the stones of what mankind is made of with a symbolic sky reflected in the depth of a well, the legend of the land of the holy crosses (Santes Creus) —the crosses that farmers put on the bright remains of phosphorus from the bones of dead animals— and the myth of the land and animals emerging from the waters. All told and performed in completely different styles, including czech-marionette, musical comedy or happening and with some common elements. In fact, they played a lot with the stones —at one point, the audience was asked to touch the walls— and with water. One of the more elaborated sketches from the point of view of symbology was in the second cloister, where a subtle universe of figures was set in the central fountain and it apeared to the perception quite slowly, just as the attention of the public focused on that new situation and wher the people were given a piece of mud to make a new figure. Another one was in the former kitchen, where an installation between the ready-made and the objectual poetry played smartly with number three —three cards, three fruits, three choices— and other elements like a window and a glass with a gothic profile painted on it. At the end, almost one hour touring through theatrical possibilities that seduced the audience to the point of almost making them believe they where watching an actual show. The exit was through the church, where a slideshow of the creation process could be seen. 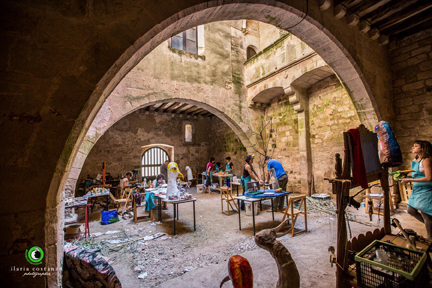 Atelier della Luna is programming regularly international masterclasses, courses and workshops in the Montefiore Conca Castle, in the region of Emilia Romagna, Italy, and in Santes Creus Monastery in Catalonia. Jordi Bertran, Marcel·lí Antúnez, Silvio Castiglioni and Brina Babini, among others, have leaded those courses. (c) All photographs by Ilaria Costanzo.